A cheeky prompt on Instagram made me realise that I’ve haven’t put up a recipe in a while. Hopefully, you can forgive me with these ‘so easy to throw together you might actually be considered a proper baker’ muffins. The husband fancied some kind of chocolate fix, and ever the diligent partner (and control freak when it comes to the kitchen) I gladly stepped in (this benefits me hugely as I know I can create something pretty good without any unnecessary sugars). The bananas provide the sweetness so no added sugar is needed (er, although they do have dark chocolate chips which makes them a teensy bit decadent, but hey, life’s about balance eh? You could substitute the dark chocolate for vegan chocolate if you wanted to. Straight out the oven with the chocolate melting and gooey peanut butter centre makes this one of my most favourite happy accidents to date. Please do give them a go and let me know you think! Line a 12 pan muffin tin with paper liners and preheat the oven to 175ºC. In a large bowl, combine the mashed bananas, eggs, coconut oil, vanilla extract and ⅓ cup peanut butter until fully combined. Bake in the preheated oven for about 20 minutes. A toothpick inserted into the center should come out clean. Remove from oven and place on a wire rack for about ½ hour to cool (or eat them straight out the oven – be careful – it will be hot!) 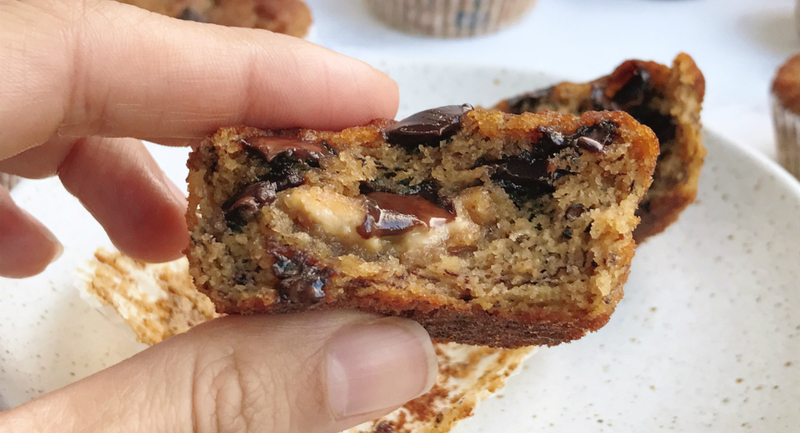 so you can enjoy the gooey, chocolatey goodness! Low carb, wheat and gluten free pancake recipe! Blueberry Overnight Oats Can Vitamin D Boost Fertility?